When I was asked to write a piece about my favourite place in New Zealand, I was very tempted not to. 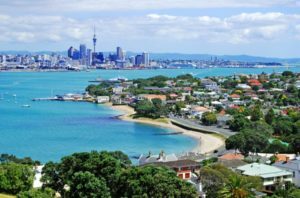 Rather, to write about somewhere well-known, like the glorious golden beach of Kaiteriteri, or to write about Otago in the deep south, like the wee coal mining village of Kaitangata that holds a special place in my heart. I want to keep my favourite place a secret; I want to keep it for myself and for it not to become another tourist attraction. But, I just can’t do it! I have to tell you…I have to make sure that this Kiwi secret is shared and that everybody can experience this natural wonder. In my humble opinion, this tiny slice of New Zealand is, indeed, the most wonderful and beautiful place in the entire world. I’m talking about Ohau Stream. You won’t read much about it, or hear a lot about it, because it is a little diamond that New Zealander’s like to keep to themselves. You’d drive past it completely oblivious to what you were missing. And I’m here to tell you all about it, and urge you to take 30 minutes of your life to experience one of nature’s most breath-taking wonders. 26kms north of Kaikoura, there is a small gravel parking area just off of State Highway 1. There is a DOC sign telling you that you’re at Ohau Stream. Walk along the 10-minute track, under the railway viaduct, following the damp gully of the stream. It is a haven of New Zealand flora and fauna, with Tui’s singing overhead from the Tutu trees. When the path comes to an end – you’d be forgiven for thinking you’re in paradise. There is the most amazing waterfall in front of you, crashing down into a luscious rock pool. But the best part is… this is where the seals leave their pups to play whilst they spend the day fishing. It is, quite simply, incredible. 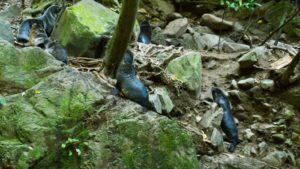 The pups frolic and play in the water, they will come up to you if you’re brave enough to climb onto the rocks, and will sway their heads from side to side, brushing their whiskers against your hand. Some of the locals are known for taking up a football, and watching the seals play with it in the water! You won’t want to leave. You’ll take hundreds of photos. You’ll even be tempted to jump in the pool! And you’ll drive away with the biggest smile on your face, and most probably, a tear in your eye. Ohau Stream is not only my favourite place in Aotearoa, it is my favourite place on this planet. It is Mother Nature’s finest recipe. The ultimate experience for those hiring a campervan – enjoy! Raglan is my favourite place in NZ because it’s a great place to chill out and hang out with some of the most bohemian people in the country, people that enjoy a very unique lifestyle and have a strong link within many different sources of art and culture. There’s live music every night, art galleries, weekend markets, and much more. Raglan is one of the few places on earth that roast their own coffee so there’s another reason; to stop and get a taste of it. Raglan has a big harbour so keep your eyes relaxed when walking through the town. You want some more reasons? 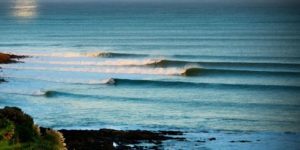 Okay, Raglan is home to one of the most prestigious left-hand waves on the planet, with more than 700 metres to ride, on perfect days you don’t need anything else. And on top of that it’s one of the best places for kayaking, wakeboarding, skydiving, tramping, fishing and just really a good town to stop by. If you’re renting a campervan, its just a short 2 hour road trip from central Auckland. I have a million favourite places for various reasons, be it the incredible scenery, the things to do and/or the epic memories, so I’m going to share a couple. 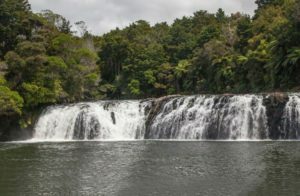 Firstly, I love the ‘Winterless North’ – my family have been spending their summer holidays at a tiny beach camping ground 30mins from Kerikeri for as long as I can remember. There’s absolutely nothing there aside from a motel, a campground and a caravan that sells fish’n’chips but there’s always loads to do, from lazing about on the beach to climbing the hill to the Rainbow Warrior Memorial to diving, snorkelling, fishing or taking a boat trip out the Cavalli Islands. Bliss. Secondly, I’m a real Auckland girl. People bag my home town out but it’s awesome if you know where to go and what to do. If I’m spending time in the city I’m all over a trip on the ferry across to Devonport for lunch, cruising out to Piha or Karekare beach on our wild west coast for some beach time (the scenery here is out of control) and back out to St Heliers for an ice cream and dinner on the waterfront. Lastly (I could go on forever), I’ve just spent a few years in Queenstown. No doubt you’ve heard of it and are intending to go down there and I can’t recommend it enough. I’m big into jumping off and out of things and this is the place to do it, from planes to bridges to swinging through canyons, I’ve done it here and I’d do it again and again. 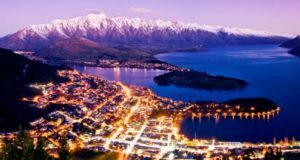 The nightlife in Queenstown is legendary and the scenery, particularly on the road out to Glenorchy (go to Paradise if you can) is postcard perfect.